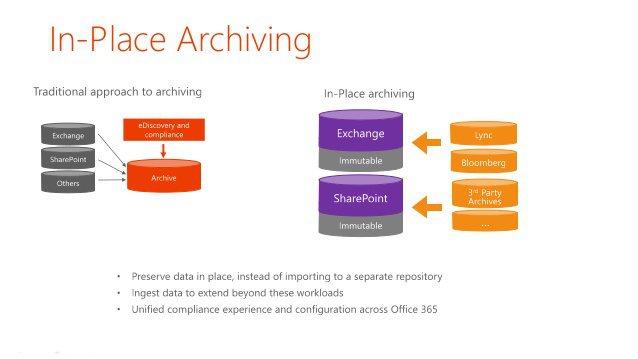 In-Place Archiving eliminates the need for Outlook personal store (.pst) files and allows users to store historical messages in an archive mailbox accessible in Microsoft Outlook 2010 and later and Microsoft Office Outlook Web App. You can provision a user’s archive on the same mailbox database as the user’s primary mailbox, another mailbox database on the same Mailbox server, or a mailbox database on another Mailbox server in the same Active Directory site. This provides flexibility to use tiered storage architecture and to store archive mailboxes on a different storage subsystem, such as near-line storage. In cross-premises Exchange 2010 and later deployments, you can also provision a cloud-based archive for mailboxes located on your on-premises Mailbox servers.